Have any problems or suggestions? You can reach us at support-pacman256@bandainamcoent.eu. Requires iOS 7.1 or later. Compatible with iPhone, iPad, and iPod touch. I love Pac-man. I always thought the classical frenzy would be my favorite, yet this twist, is amazing. It starts easy and gets harder, yet in a more frantic way. 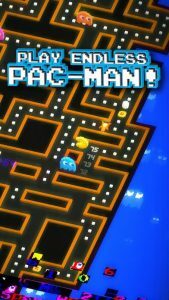 The power ups, power pellets, fruit that Pac man eats and gets more points than normal for a duration, and 256 dot-chains that destroy all ghosts on the screen, are all incredible. Also it is cool that the PAC dot chains are 256 of them since the original PAC man had 256 levels then was supposed to end, although I don’t know how anyone is supposed to be that, which made the original fun as well. If I could make one suggestion, although this game seems to be perfect and I understand if it doesn’t get added, is I would love to see the ability to upgrade fruits. Thank you for reading and I love this game so much! Subscribe to our mailing list and get free apps & games daily to your email inbox.